Discussion in 'Lounge' started by TestDummy, Jul 19, 2008. Does anyone have any lodging recommendations in the Virginia Beach area? Me, the wife and the girls want to have a 3 day weekend somewhere on the coast. Dan? Maybe, if you help, I'll stop buy and let you give me a few beers. Possibly next weekend, but surely before the 20th of August, thanks. What is your preference for types of hotels, or if you prefer you can PM me with details and I'll do some local checking. I'd offer bed and breakfast here however, I will have a full house 'til 31 July with visitors from out of town. It might behoove you to let me know though, there are a couple of Military Beaches that are somewhat "better" than the run of the public beaches and I might be able to make arrangements to get you access to one of those. As I have discriminating tastes, I'm a 5-Star Hotel kind of guy,....with a 2-Star budget (with 1 being a Red Roof). We need a nice, clean place, preferably with a pool, close to the beach (my little one loves the ocean) and some restaurants. I have no idea what goes on over there. The furthest East Iâ€™ve gone is Busch Gardens. Iâ€™ll Google search in the area you suggested. Iâ€™m not sure how big your castle is, but I can guarantee it ainâ€™t big enough for my three ladies. I appreciate the offer though. The Military Beach sounds intriguing. Iâ€™m not sure I want to bring an attracting 16 year old girl there though. Iâ€™d hate to kick a bunch of Navy Seals asses and embarrass you. Oh, I didn't know you wanted the SEAL beaches, no problem. I can arrange that. ST 2, 4, 8, 10 at one base, and ST 6 and SPECWARDEVGRU at another. No problem, can do easy. Virginia Beach waterfront is going to be expensive but has all you ask for except the prices. Chesapeake / Greenbriar Mall area has all you want except beaches within walking distance and would be a little less expensive. I'm sure Spence might have more info - the Beach is his town, I just work there and otherwise avoid it except for the bases. On the water front on the beach - $144.00 to $244.00 each night. 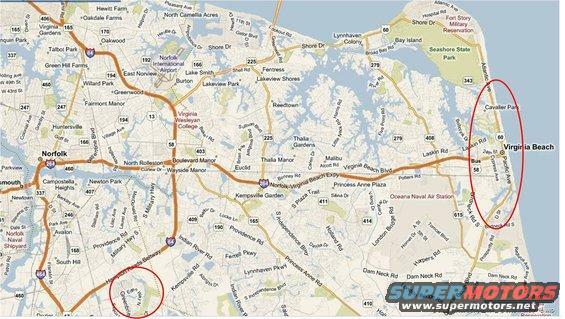 Chesapeake / Greenbriar area - 20 to 25 Minute commute to beach - $68.00 to $88.00 each night. Sean, try something a little more inland than "the beach". It's over rated anyway. If you can get around 15 miles west you might find some good prices. Always the best bet, for economy, off the beach just a bit. Similar places in Ca. across the friggin' street from the beach side are typically 100-150 bucks less. Hello!! It's just a 100 yard walk across the GD hwy and down to the frikin' beach!!!! At the oceanfront area, Pacific Avenue is always cheaper than Atlantic .. reason is 1 blocks difference to water, North End is cheaper than South End,, More stuff at the Southern end near Rudee Inlet,,,,Weekdays are cheaper than weekends, Sometimes at the smaller private hotel/motel, paying cash can get ya a good discount,,, with the gas problem this season they may even negotiate a rate,,,,,, A caveat is if you get one of our Indian freinds on the phone make damn sure you can get a refund if you don't like the rooms,,, They have had some problems here since a lot of motels have changed hands and these boneheads think they are still in Calcutta worshiping cows! Thanks guys. Does anybody have any names of Hotels? The 'north side' on 'pacific ave' doesn't really tell me a lot, as I've never been there. http://www.virginiabeach.com/ Sean try this search page, it will cover just about every place in the area..North End is above 31st street and only a few motels. Pacific Avenue is the 2nd street West from the water and has a few motels ,not the real fancy types but acceptable ,,, Your main thing to do is get reservations , Ive seen the hotels fill literally overnight for no reason and other times not sell out on a weekend I lived doen there for about 5 years in the early 90;s and now try and stay away due to not liking crowds ..
We visited Virginia Beach a few times but only stayed there a couple of times. I thought I remembered the hotel rates being pretty reasonable then but thats been 5 or 6 years ago. The walkway that runs along the beach was pretty nice and there's lots of stuff to do in that general area. There's a very good aquarium near Virgina Beach, and the Mariner's Museum in Newport News was pretty interesting to me. If you have the time, the beaches at the Outer Banks of North Carolina are much nicer in my opinion. No offense to you Virginia Beachers. all you got is Muffler Man! Not true. We have a motel and an antique store too. And we got a McDonalds last month or so. IN YOUR FACE. No place is a place until it gets a Walmart! In your face!!!! They's 4 Super Walmarts within 15 miles, does that count?